Add social media to your engineering toolbox with an ASCE webinar. 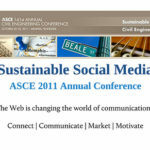 ASCE has created a webinar from the sustainable social media panel hosted at last year’s annual conference. Recall the September 12, 2011 post about the session and the October 29 live tweets featured on this blog. 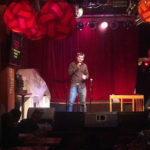 Effective social media is not about creating a Facebook page so people can find you; it’s about long term engagement. Social media means listening to your stakeholders’ needs and creating strategies for deeper two-way conversations. Find out how to get the most out of social media engagement in a free eLearning Webinar, Social Media: The Powerful Tool Engineers Can Use to Build Client Loyalty, Enhance Project Delivery and Take Charge of Your Career Growth. With a good grasp of social media, you’ll benefit from enhanced project delivery, client loyalty, volunteerism, recruitment, stakeholder interaction, project management and marketing. 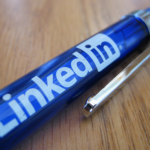 Think social media is only for students and young professionals? See examples of how successful engineering agencies, companies and professionals at every career stage are reaping the benefits of social media. Featuring Ken Maschke, P.E., S.E., M.ASCE, Thornton Tomasetti, Anthony Fasano, P.E., M.ASCE, Powerful Purpose Associates; Scott Harris, Public Affairs Specialist, U.S. Army Corps of Engineer;. Nancy Gruwell, Vice President, Director of Marketing Services, HDR Inc. Milissa Reierson, Communications Manager, City of Franklin, TN. 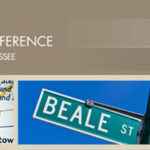 This webinar, the first in a series highlighting social media as an engagement tool in your professional life, is built upon an informative and popular session held at ASCE’s 2011 annual conference.